Before entering the voting station, make sure that you have your I.C., you’re not wearing a shirt with any party’s logos, and that your nails are not painted. Make sure that your ballot is clean of any markings before voting, and if there are any problems, call an SPR staffer and watch them void the ballot before proceeding. It’s natural to feel overwhelmed with all of the information you need to process for election day. From the promises and facts made by all sides of the different political landscape, to how and when we can vote. We won’t tell you which political party to choose, but what we can tell you is exactly how you make sure that your vote actually gets cast. It would be a shame if you were turned away from voting for things you didn’t know were not allowed in the voting booth. This is pretty self-explanatory. Voting is only open for Malaysian citizens, so it makes perfect sense that they would want to identify that you’re Malaysian, you are actually who you say you are, and that you can only cast your ballot once. Typically, the staffers will simply check your Mykad for this. But if there is a problem with your Mykad, you can choose to instead present your Malaysian passport, receipt for Temporary Identification Card with a photograph, a receipt of Loss of Identification Card with photograph certified by the National Registration Department, your driving license with a photograph, or an authority card with photograph issued by a government department. 2. Don’t wear clothes with any party’s logo on it. If you have to identify yourself with your preferred party, maybe stick to Facebook frames, and the rest of the 364 days in the year. 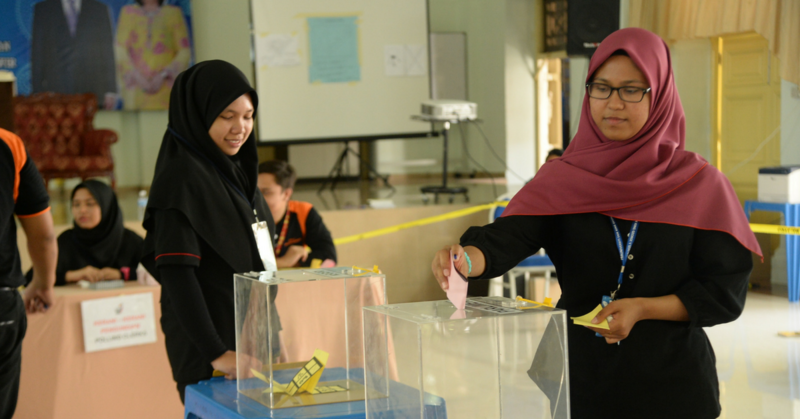 But on election day, opt to instead wear a politically neutral shirt because you could be imprisoned for 1 year, or get fined up to RM5,000, or both. You can’t be within 50 meters of any polling station with an item of clothing bearing the name of a candidate or the emblem, name or symbol of any political party. This includes all items of clothing from shirts to accessories. This rule exists because all campaign activity is by law, supposed to cease on election day. Therefore, wearing clothes bearing any logos or names can be seen as a form of campaigning. 3. Make sure that your nails are unpainted. If you have painted nails, SPR will have difficulties in applying the indelible ink on your nails. However, according to this 2008 statement by SPR, henna is allowed because it is red and a different colour from the indelible ink that indicates you’ve voted. According to that same 2008 statement, they will not provide nail polish remover at voting stations either. In case you were wondering, if the potential voter does not have any fingers, then SPR will apply the ink on the appropriate arm stump. 4. To vote, leave an X in the column next to your candidate of choice. Editor’s Note: This section has been updated to reflect what markings are permissible. 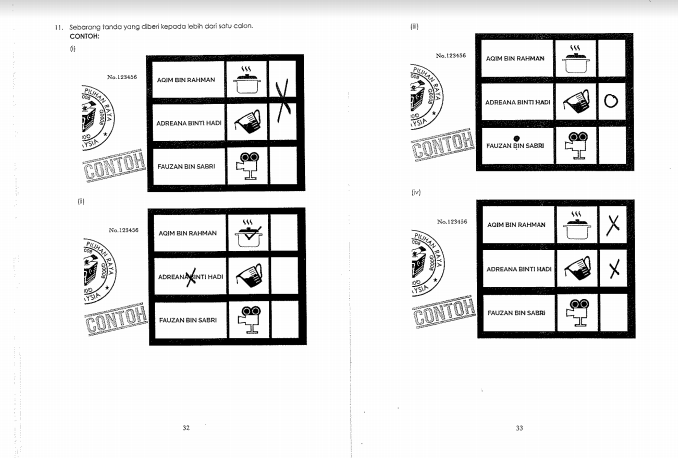 The best thing you can do to the ballot paper is to mark X next to the candidate of your choice, and then put it into the box. 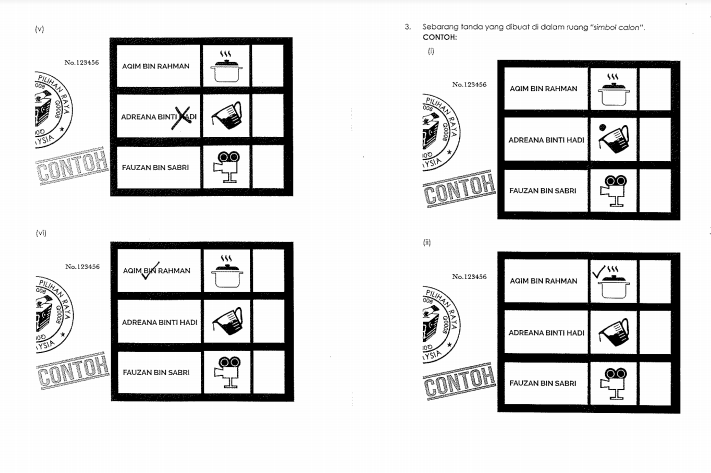 However, there are actually a reported 39 ways in total to mark the ballot papers. 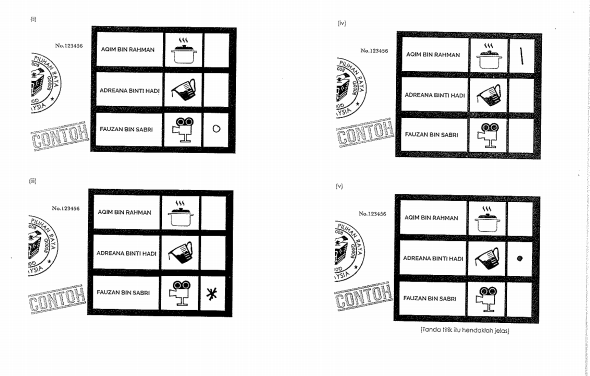 According to a document on Bersih’s website, marks like a tick, line, circle and asterisk are all alright. You can even make the mark onto the candidate’s name, or party symbol. 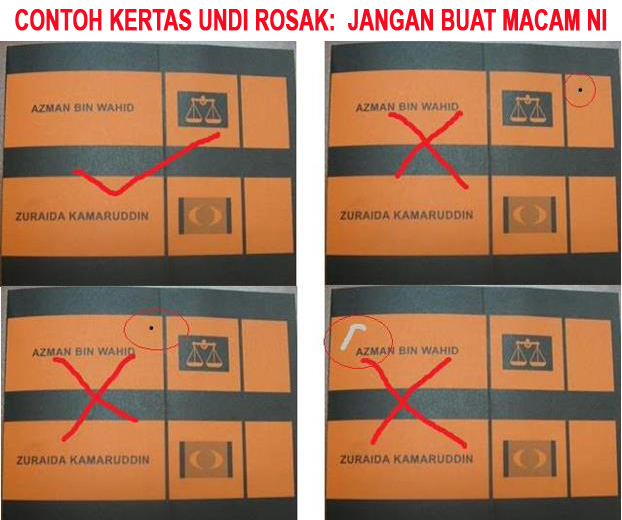 Things that will make your vote be considered an undi rosak include having multiple markings that cover 2 different candidates, or that show an overlap. Having words or drawings will also disqualify the vote. So yes, no smiley faces. 5. If there are other markings on your ballot, it will disqualify your vote. Make sure that when you get your ballot, you only leave an X next to the candidate of your choice, and that’s it. Leave no other markings if you want your vote to count. Otherwise, it will be considered as an undi rosak, and your time lining up would have been for nothing. If your ballot comes to you with smudges or markings, you should call for an SPR staffer and watch them void the ballot. Some parties suggest that you could even mark an X next to all of the candidates’ names just to be safe. 6. Do not use your phone while voting. This also means that you can’t pick up any calls while you are in the voting booth, and especially do not share any photos or videos of your voting process. 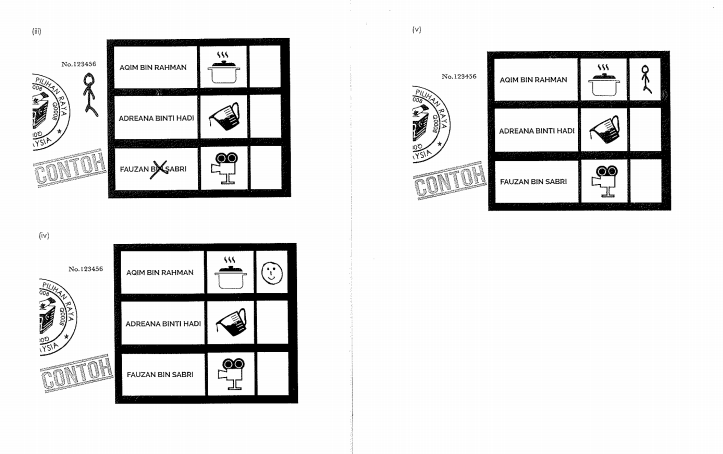 Each ballot should come with a unique serial number, and a stamp to ascertain that it came into the voting booth unmarked before you manage to get your hands on it. Similar to the above, if your ballot comes without a certified stamp and serial number, you can call for an SPR staffer. Don’t leave the booth. 8. Don’t take ballot papers out of, or bring them into polling stations. For this, you could face prison time for up to 2 years, or a fine of no more than RM5,000, or both. You could even be suspended from voting for 5 years. If you happen to have an extra, regardless if it’s used or unused, you should inform an SPR staff and watch them void the ballot. 9. Don’t loiter around polling stations after casting your vote. If you need to wait for someone after casting your own vote, do it at least 50 meters away from the polling station, according to AskLegal. This could subject you to imprisonment for up to 1 year or a fine of up to RM5,000, if not both. Since this year’s voting day is on a weekday, find out if you should be given a day off by your bosses here.